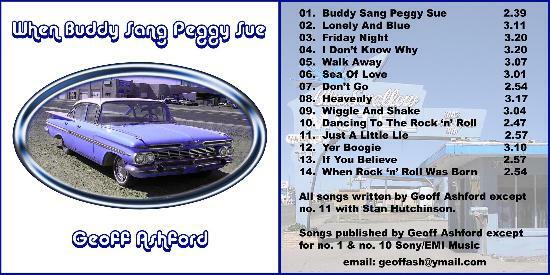 When I listen to the song, I always hear: "And Buddy Sang Peggy Sue", but the title of the song is "And Buddy Played Peggy Sue". Here's the information you asked for. I wrote the song only a couple of weeks before we recorded it in 1974. Buddy Holly. I didn't know they were friends till years later. and Tommy Steele, but Buddy's songs turned me on the most. von ihm berichten zu können. a real thrill for me. I was born and went to school in Leeds, West Yorkshire, England and it was at school I became interested in music and playing musical instruments. I was always involved in any musical projects and played cornet in the school brass band. My guitar playing started when I was fourteen and my first group consisted of close friends. After a few months of rehearsing we played at least five nights a week in pubs, clubs and at youth club dances. I turned professional when I was eighteen and my first taste of life on the road was a trip to Germany, working on the Star Palast circuit. 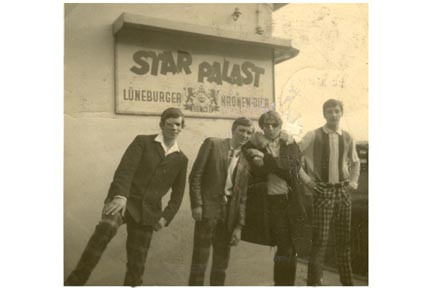 Geoff Ashford und Band vor dem Star Palast in Lüneburg. In Germany we played with some great English bands and some great German bands including the Phantom Brothers. I had started song writing by this time and my group was offered a recording contract with C.B.S. under the direction of Irving Martin. After a chance conversation with a London agent I was offered a sixteen week season on the Cunard ship the Q.E.2. I visited numerous places whilst playing on the ship, but probably the most important were the trips to New York where I met some great artists and publishers who gave me help and sound advice that would prove invaluable to me in the years to come. Back in England I was offered a job as lead guitar/vocalist working at the prestigious Ritz Ballroom in Manchester. I spent the next year or so there before moving to another Mecca ballroom, The Golden Palms in Blackburn. 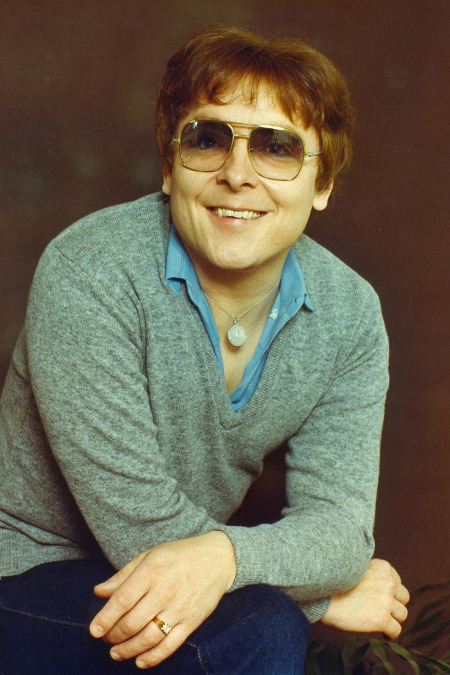 On the strength of some of my songs the band was offered a recording contract with DECCA and I was signed as a writer to Micky Most's company RAK. A single was released "Wish A Little Love" produced by hitmaker Jack Baverstock and arranged by Del Newman who's work with Cat Stevens and Neil Sedaka had earnt him a great deal of respect. Members of the band were Gill Mitchell, who later sang with the Ray McVae orchestra, and also spent many years with Freddy Star's band. Sandra Stevens, who found fame with the Brotherhood Of Man and Mike Harrison, who worked with Alvin Stardust's band The Heartbeats. My next recording contract was with Warner Brothers with old friend Irving Martin as producer, along with a writing contract with ATV Music under the direction of Tony Hiller, who wrote the Eurovision winner "Save Your Kisses For Me". A single was released "Charmer" which was considered an airplay hit. 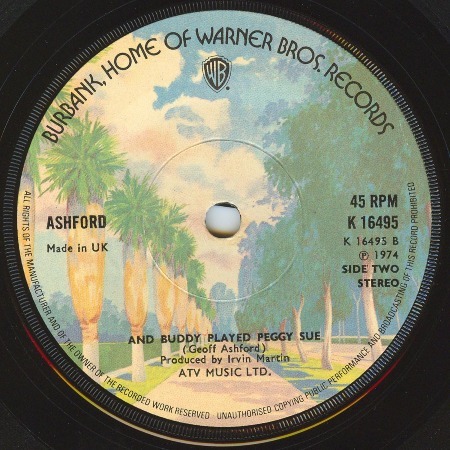 The B side "And Buddy Played Peggy Sue" was later released in the States. After a year or so of writing and recording I felt it was time to get back on the road and joined a popular showband Black Onyx. In the following years the band worked very hard in the major cabaret venues, sometime doing ten or fourteen shows a week. During this time I wrote very little but the band was offered a record deal with PYE Records, but the tracks were never released. The next real change came when I decided to work as a solo performer and start writing again. I spent some happy times touring the clubs around Yorkshire and my songs were starting to once again be recorded and released. International folk group, The Spinners recorded "Hold Out Your Hand", a song I had written with another writer, Marie Copley. Also Stan Richards who played Seth Armstrong in the TV. soap Emmerdale Farm, recorded "Grandads Motto" with The Brighouse And Rastrick Brass Band. My country career began whilst recording a demo at a local studio. During a break I played a country song I had written to the studio owner Bill Clark, who was for many years George Hamilton IV's musical director. Bill suggested I contact Tony Goodacre, an established country artist who was setting up a publishing company. 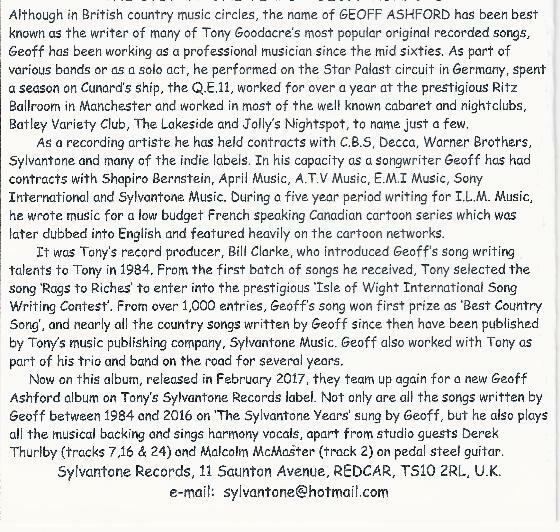 After initial meetings Tony and I became great friends and in the subsequent years Tony not only recorded numerous Geoff Ashford songs but also placed them with many other established artists. With Tony's company Sylvantone, my songs made many country music airplay charts around the world and my song "Rags To Riches" won the TDK Award as best country song in an international song competition. I was invited to sing the song on various TV programmes and was guest on numerous radio shows. I worked as a solo artist, singing and playing my songs and played at some of the major venues and festivals including Wembley. A song I co wrote with Tony was featured on Dutch radio and TV and was used to promote one of the best country festivals in the world The Florallia Festival at Ousterhaut. In the mid nineties I was offered a very lucrative contract to write theme music for television and spent the next few years in my studio working on instrumentals and themes for various projects. My theme tunes proved to be more successful than I could have hoped for and my music appeared in many programmes in Britain and Europe. A low budget cartoon series made in French for the Canadian market, was subsequently dubbed in other languages and was featured around the world. In 2002 I put together an album of my favourite unrecorded songs, mainly to send round the trade, but the album was picked up by lots of local radio stations and one track "High And Low" received extensive airplay. In the spring of 2003 I released a country album "Shades Of Country" containing fourteen new songs, again I was very lucky in securing many local and internet radio plays around the world. Some of the songs were featured on the Vitaminic Music site and my song "The Lasting Kind" was number one in ten countries. For the future, I am writing and recording new material. I would like to maybe do some live appearances for the fans who have been very loyal and supportive to me over the years and have kept in touch, even during the periods when I was not performing live shows. In December 2016, I contacted Geoff again. Lovely to hear from you, I hope you are well. it on your site if you like it. 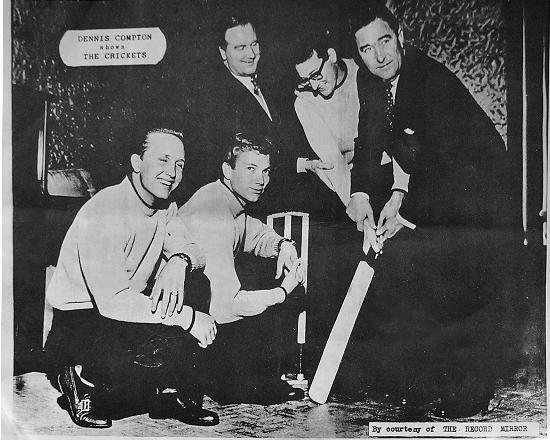 Evans, they were both famous cricket players in England in the fifties. All the very best wishes for Christmas. business probably fifty years ago. 2. Run Back to Me. A simple love song in the best traditional country mode, with Malcolm McMaster adding his pedal steel guitar in January 2017 on this track. Geoff’s original demo recording of this song was no.4 on the Soundclick chart in 2010. 3. Our Anniversary. The perfect song to dedicate to your loved one. In Irish waltz tempo, download to play and dance to this, or write to your local radio station as a request. If you are an active artiste, the perfect song to record or perform regularly – it will become one of your most requested songs. 4. What’s Right Tonight. A typical traditional cheating song with a shuffle tempo. 6. Two Glasses of Loneliness. We’ve all seen a man sitting on his own in a bar, looking into his glass of beer, and thinking of the man he used to be. 7. Cotton Candy World. A happy song, equally popular with both adults and children. Tony’s own version of the song can be seen on youtube. 8. The Door. A story song in waltz tempo about what someone keeps as a souvenir when his house is about to be pulled down for a new road development. It happens to a lot of people everywhere. 9. Atomic Wars. Perhaps pushing the boundaries of country music a little, but the lyrics will certainly make people think. After all, Geoff has the ability to be given a subject, and within a day or two, he has written a song about it. 10. The Artist. The story of a man who is torn between his love of painting in Paris and returning to Susie, his loved one in London. 11. Return of the Conquistador. A Tex-Mex influenced instrumental, on which Geoff shows his abilities on both keyboards and guitars. A track which could be used as background to news of events and station ID’s. Already used for the front and end of a TV documentary about the ex-pat pensioners who ride motorbikes and gather at the American bar in Benidorm. Apparently the local Spanish call them the silver conquistadors. 12. Sidewalks of Nashville. Nashville is probably full of songwriters who could identify with this song (or have written one themselves). Fortunately for Geoff, he didn’t have to experience this himself – he’d already made his name in pop music in Europe before he began writing country in 1984, and met Tony Goodacre. 13. Far, Far Away. A story song about Scottish soldiers going off to the Crimean war. 14. We Were Right. A cleverly composed story song. A couple get married, everyone said it wouldn’t last – but it did. True traditional country feel. 16. Top of the List. Derek Thurlby adds his pedal steel guitar to this excellent traditional country track. Already voted ‘song of the month’ on the ‘Internet Country Show’ in the U.K. and a Number 1 hit on the ‘Our Stage’ internet web page. 17. Little Joe. Perhaps more ‘country blues’ than traditional country, but a good story song, with Geoff playing some great lead guitar. Reached No.2 on the Ourstage/MTV Southern Rock chart in August 2012. 18. Don’t Play Your Cheating Heart. Another traditional country song with a theme of lost love. Already proved a popular song on the dance floors for a slow tempo partner dance. 19. Boy to a Man. A story song which looks back at ‘the first time’ when the boy becomes a man. If you want to sing a song for your wife or partner, we wouldn’t recommend this one – try track 3 instead. The fade finish leaves the singer still thinking back to ‘the first time’. 20. Dancing on the Moon. It seemed right to add this song next to ‘Boy to a Man’ whilst in the reminiscing mood. This time we are with a gypsy girl in the valley by the stream. She describes love is like ‘Dancing on the Moon. 21. Say a Prayer for the Lonely Ones. A religious gospel flavoured song, which has already been used to illustrate Church Army work as part of a talk given by one of Tony’s friends at his church. 22. She Still has my Picture. The lyrics and melody of a traditional country song at their very best. 23. My Name is Billy. 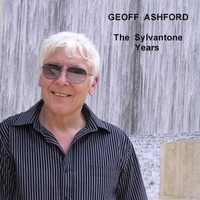 One of two songs originally recorded by Geoff and released on Tony’s award winning mixed artiste vinyl LP album ‘The Sylvantone Showcase’ in 1984. Produced by Bill Clarke, listen out for a little bit of Tchaikovsky, and who but a talented writer like Geoff could introduce Cleopatra into a country song, and get ‘round finding a rhyme for Marc Anthony? 24. Rags to Riches. 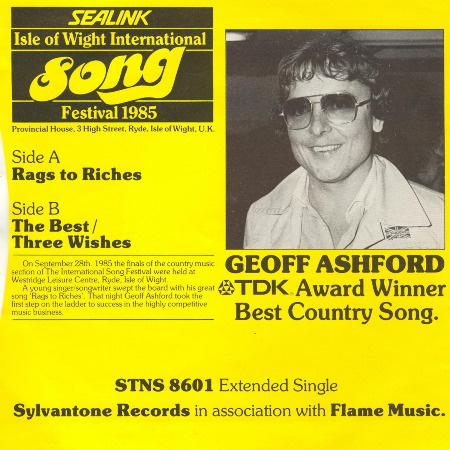 The award winning song, also originally released on ‘The Sylvantone Showcase’ in 1984, which started the continued successful association and friendship between Geoff Ashford and Tony Goodacre. A no.1 on several online music charts over the years. Enjoy listening to your downloads, and thank you for your support. Geoff Ashford & Tony Goodacre. February 2017. Good luck with the CD, Geoff !